Architecture studio Deborah Berke Partners has completed a glass office tower with "inflections and projections" for a century-old motor company in the American Midwest, which is well-known for its patronage of modern architecture. The Cummins Indy Distribution Headquarters occupies a four-acre (1.6-hectare) block in downtown Indianapolis — the state capital of Indiana. The building is concentrated along Market Street, a major thoroughfare, and helps define a "street wall" in the Market East cultural district. Built on the site of a sports arena that was razed in 2001, the building serves as a global distribution headquarters for Cummins, an engine and power generation company based in Columbus, Indiana, and a longtime patron of progressive architecture. The company is credited for bringing top architects – such as Kevin Roche, Eero Saarinen and IM Pei – to Columbus and turning the small town into an architectural mecca. 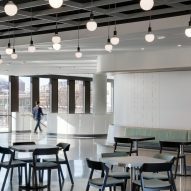 The aim of the Indianapolis project was to provide a high-quality working environment for the company's employees, while also aiding in the resurgence of the city's downtown area. New York-based Deborah Berke Partners, founded in 1982, was chosen for the project through an invited competition. 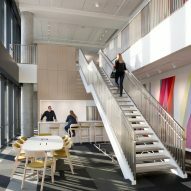 "Over the decades, Cummins has demonstrated a commitment to great design that benefits its employees, its customers and the community," said Deborah Berke, who leads her eponymous firm and serves as dean of the Yale School of Architecture. 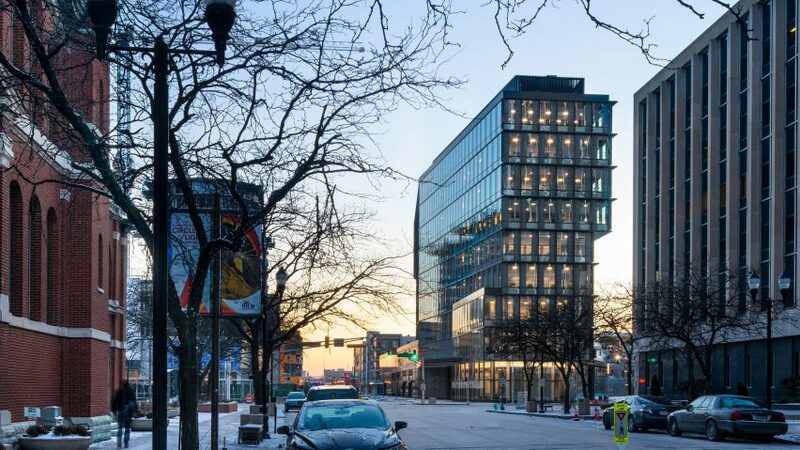 "This building carries that legacy forward with an environmentally sustainable design that dignifies the work going on inside while enhancing the urban realm." The tower contains offices, social areas, conference facilities and retail space. Rather than creating a standard boxy tower, the team conceived a narrow, nine-storey building with shifting floor plates, some of which slightly cantilever outwards. The variations give the building a sculptural appearance. "A sculpted tower, with its inflections and projections, adds a striking landmark to the city," the firm said. The building is sheathed in glass, which ushers in ample natural light while also providing expansive views for workers. Metal fins help mitigate solar heat gain. 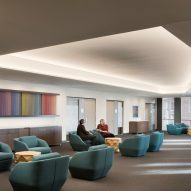 "The building's articulated facades and distinctive form serve a purpose – to create a comfortable, light-filled work environment for employees that adds to the vitality on Market Street," said Berke. 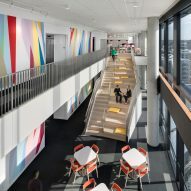 Inside, the tower features open, flexible areas for working and socialising. The ground level contains the reception area, bike storage and retail space. The second floor houses meeting and training rooms, a large kitchen and a terrace. 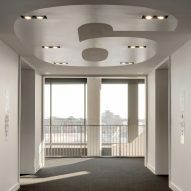 Upper floors encompass open-plan offices and "social hubs". The tower is connected to a multi-level parking garage, and overlooks a verdant park with a small amphitheatre and quiet spaces for meditation. 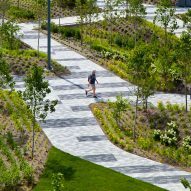 "Adding some muscle to the great bones of downtown Indianapolis, the park is a public amenity that does double duty as a robust piece of green infrastructure," said Berke. The office tower is the latest by Cummins that demonstrates its enduring commitment to contemporary architecture. The company, founded in 1919, has not only hired leading architects to design its own facilities, but has also subsidised the design of public buildings throughout Columbus. In the 1950s, the company's late CEO, J Irwin Miller, started the Cummins Foundation, which aimed to elevate the town's architectural landscape by paying the design fees for new public buildings. Roche, Harry Weese and Gunnar Birkerts were among the architects commissioned to design buildings through the programme. The initiative prompted other companies and institutions in town to commission leading architects. Today, Columbus — which was featured in a recent movie — is recognised as one of America's top architectural meccas. In 2006, Berke designed a small, drive-through bank for the town. Deborah Berke Partners' more recent projects include the conversion a historic mental asylum in Buffalo into a boutique hotel, and plans to turn a former New York prison into a women's rights headquarters.